Managing the inventory levels and stocks within the facilities has always been a challenge, with traditional issues such as stock-outs, and over-stocking commonplace. There was also the time burden to staff in trying to control the inventory. Hurst Green Plastics teamed up with The Trust’s Inventory Management Project Manager, Debbie Ingleby, who was tasked with finding a solution to the problem. Working closely together, it was soon realised that implementing the two-bin TwinBin system would help eradicate many of the issues experienced by the NHS. The innovative and patented TwinBin System was implemented initially into West Park Hospital in Darlington and is being rolled out to the Trusts’ other hospital locations. Time is saved by placing all the necessary day to day medical products in one area of the unit, this means staff spend less time searching for required items and more time treating and caring for their patients – and within this sector and particular trust, that extra time is invaluable. The patented TwinBin System eradicates stock control problems whilst keeping stores organised and tidy and in conjunction with the FlagBin system, Nurses are aware of stocks running low before they run out – meaning more time is saved when re stocking and re ordering these essentials for the units and wards. With the ever increasing costs for the NHS becoming under scrutiny – the TwinBin helps to prevent over ordering on ward essentials yet helps keeps stocks within a desirable level. Product moves in a First In – First Out (FIFO) rotation system, and chance of out-of-date stock and waste is greatly reduced. The overall process of re-ordering has become much shorter as Nurses just need to spot the bright red flags indicating to re-order. Once they have been reordered, they can change the red flag to yellow meaning “scanned”, to notify the rest of the staff that the next batch is on its way. Once this has arrived the product is placed into the TwinBins and the flag is reset to green – and the cycle then continues. TEWV is a pathfinder organisation of the North East Transformation system (NETS) programme that links six NHS organisations in the North East with Virginia Mason Medical Centre (VMMC), Seattle, USA. VMMC has employed the principles of the Toyota Production System and Lean to dramatically improve the quality of the healthcare services they provide. We aim to create a system where the right item is always available in the right amount at the right time in the right place and in which clinical time spent on ordering and managing stock is reduced as far as possible. As a provider of mental health services, we need to stock a reasonably varied selection of clinical consumable items, although we don’t tend to use any of them in large amounts. Each item has a minimum order; for example most syringes and needles come in boxes of 100 and some items are supplied individually. 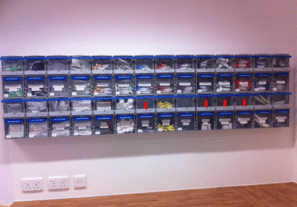 Previously in the Trust, each in-patient ward ordered their required supplies individually, but this resulted in not only overstocking of items and consequent financial waste as a result of items either going out of date or becoming obsolete but also to untidy and overcrowded clinic rooms where it was difficult to find the correct item. On our main inpatient hospital sites we are working to implement central buffer stores and for each ward to keep just one week’s worth of inventory in their clinic room. 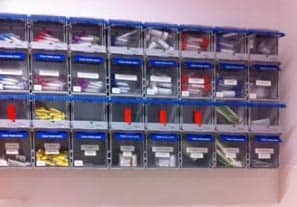 Where possible, we have used TwinBins which provide us with a kanban dispensing system. The TwinBin is very easy to use and provides a visual signal that tells us when we need to get more stock. The two bin system ensures that we do not run out of stock. It also allows for First In First Out rotation of stock which ensures that stock does not go out of date. Each TwinBin contains an agreed amount of stock of an agreed item and stock is only ordered when required. Where we have implemented inventory management processes we have seen a reduction in the number of orders placed, a reduction in expenditure and more importantly a reduction in the amount of clinical time spent in ordering and managing stock. Hurst Green Plastics are looking forward to the continued development of a flourishing business relationship with TEVW NHS over the next coming years.